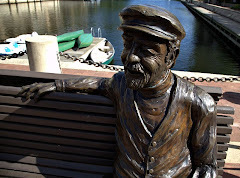 Restonian: News blog from Reston, Virginia, the mauve-colored New Town (tm): Reston: We're #37! This planned community is built around Reston Town Center, where residents shop, dine, ice skate in the winter and attend summer concerts at an open-air pavilion. Residential streets are lined with tree canopies and surrounded by Fairfax Countys lakes and trails for families to enjoy canoeing, kayaking, hiking and horseback riding. Proximity to Washington D.C. provides plenty of career opportunities. But street traffic can be maddening. Pretty sweet, right? Well, a non-existent place called "Hunter Mill" ranked 19th, presumably because of its McMansions and proximity to Wolf Trap, "Sully," another non-town, ranked 25th, because you can go see the new Air and Space Museum daily if you so choose, we guess. Burke, the county's other semi-planned community, ranked 31st. Herndon, sadly, didn't even make the list. Could be worse, though. We're definitely radder than West Bloomfield Township, MI (#36) or Frisco, TX (#38). We don't walk across covered bridges wearing knee-high boots and khakis like the twits pictured above in Plymouth, MN (#1), and we still rule the pools and the schools when it comes to old nerds.